North Slope Farm is invested in managing small flocks of hens for the production of eggs. If you would like to join the list of interested consumers, please email northslopefarm@comcast.net, subject eggs. We will reply and then update you as to egg availability. The cost per dozen is $7. Buyers clubs are encouraged and can receive reduced prices with minimum orders of 10 dozen per week. Available at Hopewell Farmers Market, Wednesdays 2-6. Local deliveries can be arranged. 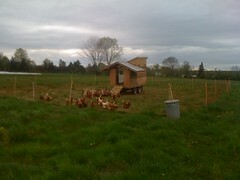 During the Summer Season, the eggs are available at our farmstand and at the farmers markets we attend. During the Winter season, the “new girls” start laying and our supply steadily builds. Our goal at North Slope is to focus on the wholesale value of the product. If the wholesale price is valid to support the production, then the situation is sustainable. Primary cost is feed. We conciously support our local feed store, that stocks Organic Feed, (Rosedale Mills, Pennington, NJ), and that item is a baseline cost. Additionally, the cost of labor, bedding and infrastructure. North Slope Farm is committed to fostering a sustainable business from our Poultry Special Project and we encourage you to contact us if you want to invest in your food!